November is usually hit or miss for planning longer spins, so it was with some celebration that in the middle of November the weather was ideal for getting out. Twenty-one of us from my club, Sussex Nomads, rode the East Sussex Cycling Association (ESCA) Reliability Trial, organised this year by Brighton Mitre. 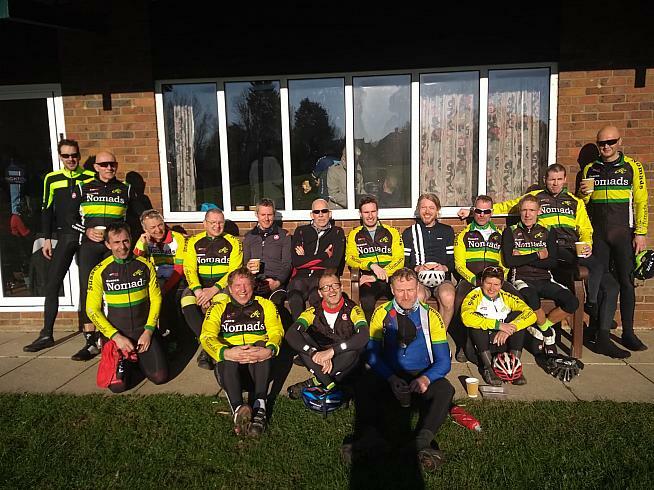 Based at East Hoathly Sports Pavilion, the route brought us through lumpy Ashdown Forest, climbing the formidable Kidd's Hill and a few other category four climbs before completing 50 miles later back at headquarters. For those who don't know, a reliability trial is basically orienteering on bikes. You cycle as teams around a set route, checking in at checkpoints to have your route card stamped. The other part of the challenge is the completion window is narrow. 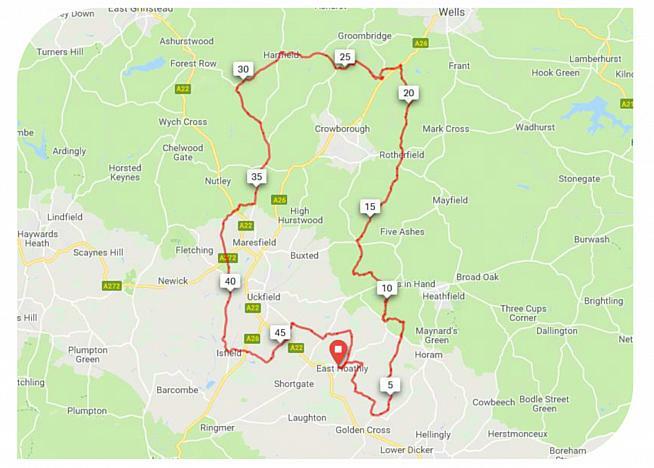 For instance, the ESCA Reliability Trial was 50 miles and cyclists had a choice to complete the route in 3, 3.5 or 4 hours. Now, while cycling 50 miles in 3, 3.5 or 4 hours may sound easy - that's a normal club run, you may be thinking - it is challenging and is different from normal club runs. From the second you roll off the start line, the clock is ticking to get around the route, which is usually lumpy. Meaning, there's not much time for mechanicals or getting lost, which can be tricky as, traditionally, cyclists are supposed to navigate the route from printed instructions, not GPX. A final complication is you only have a 10-minute window to cross the line. If you picked three hours as your completion time, you have to finish between 2:50 and 3:00 hours. Finish before or after and you're disqualified. The winner is the club that has the highest number of riders who cross the line successfully. That's what makes reliability trials fun - it takes strategy, teamwork and luck to get around. Waking at 6:00am of a Sunday morning is never anyone's idea of fun, and looking out the window to see what awaits is always done with one eye open and one closed (for fear of what you'll see, not because you're still half asleep). On this particular day, the forecast was right - it was a clear, dry day. Albeit, at that time of the day there was a thick frost on the ground. There was a small group of us who wanted to cycle over to the start and back - two of us had the idea of a final century before the end of the year. We had our meet spots and times, picking up riders as we navigated the 20 frozen miles from Burgess Hill to the venue. Eoghan - centre - and the Sussex Nomads dream team. We arrived in plenty of time. The venue was a hive of activity with riders checking in, catching up and helping themselves to hot drinks and cakes. 180 cyclists from across 11 clubs had signed up. Waves of 10 cyclists were released every five minutes. When our time came, we lined up and with a final chat with the marshals we were off - a lumpy 50 mile course lay in front of us to get around in 3.5 hours. To begin with, we stuck together as a group (partly because only two of us had actually downloaded the route!). Reliability trial beginnings are always sedate, with the first 15-20 miles being done at a moderate pace and everyone talking about the need to stay together. The two teas I gulped down at the village hall trying to warm up went right through me, and an hour in I was bursting for a loo stop! I charged ahead of the group in search of a quiet corner. Crossing over an A road on my own, I thought, was my chance to get ahead. Well, quiet was what I found - I tucked into a downhill, pulling more ahead until I found myself completely on my own. Initially happy with my circumstances, as soon as I had taken care of the immediate need I started to think, 'Wait, I've been standing on this corner now for at least four minutes. I wasn't going that fast.' So naturally, I waited another minute or two before heading back up the great big, whopping hill to see if I'd gone wrong. I met another cyclist at the top of the hill who had the route, so we stuck together - me on the front bringing us forward, and him navigating. We were almost separated ascending Dewlands Hill, a hill with an average 7% gradient. Tackling Dewlands Hill was like being on a stair climber at the gym. The hill is so steep in places that after completing a downstroke on the pedals, the bike just stopped - all momentum evaporated. It literally felt like walking up a hill, but with your feet clipped in. Fortunately, the novelty of that was over soon and we were on level ground again. After a bit of teamwork, I was reunited with my fellow Nomads. There were laughs, tears - it was a beautiful thing... until I got lost again. The second time we got lost was not my fault... I was sitting third back in a small group that had gone off the front. It's always on a fun descent that you get lost - anyone else notice that? Anyway, the three of us tucked in and flew down a speedy hill, spinning at the bottom waiting for everyone else to catch up. And we kept spinning and kept waiting. Eventually we asked James, who was at the front, if he had the route. He didn't. Being on the tail end of a chest infection he was reluctant to climb back up the hill, but that's what we had to do to get back on-route and catch our group. Back without teammates who had the route, we jumped group to group trying to catch up. You're always aware of the clock ticking on a reliability trial, but after you've been lost twice, none of you have the route and you have an hour left until you're disqualified, you start to panic! This was the case as we approached the final big hill of the day - Kidd's Hill (aka The Wall) - just under a mile at 8% gradient. Unfortunately, by this time James was really suffering from the lingering remnants of his chest infection and climbing hills was really impacting his breathing. We had also picked up a hanger-on, who was making his way up the hill and seemed to want to be that person out of the four who reached the top first. Not one to allow a stranger to go past without challenge, I knew James and Alex wouldn't mind me spinning along after the climb for them to catch up while I left this usurper behind. So I dug in and went from a neck-and-neck climb to dropping him (not that any of us were going fast, or can go fast!). 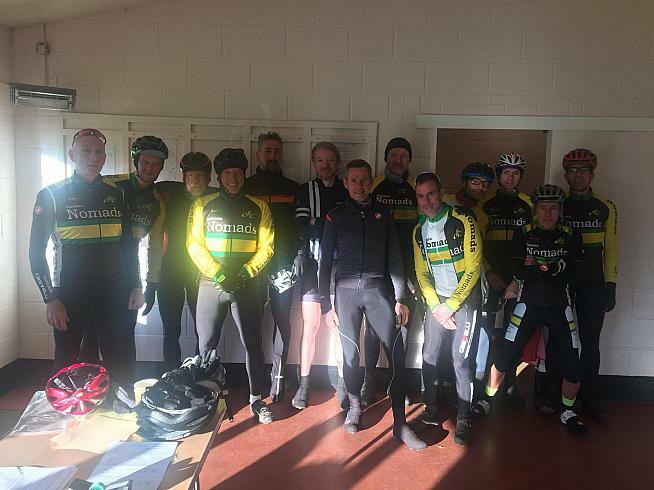 Course for the 2019 ESCA Reliability Trial. The final checkpoint was just after Kidd's Hill. We were stamped and off we rushed, with Alex sensibly pointing out we still didn't know the route and we had just passed a few Nomads who had the route - but, who weren't in our original group. Maybe we should wait for them. I pulled in about 50 feet ahead of James and Alex. As cyclists passed, they asked who had the route. The second passing cyclist owned up, and we were off chasing them... Until James decided they were too slow, and blew past them on a long descent. Being a bit behind all the action, I came out of the saddle into a sprint to catch the boys before losing them. I clattered through a massive pothole, fortunately the bike was ok, but one of my bottles was liberated from its bottle cage to go unrecovered. Long story short, we were disorganised, chaotic and couldn't come to a consensus over how to get back on track. One wanted to be sensible and stick with someone with the route, while another just wanted to cane it blindly, hoping for the best! Nevertheless, we came under some semblance of order when we linked up with a few more Nomads with the route who could easily match our pace. November in Sussex. It's always this sunny. Which we did! As did most of the Nomads - only two missed the cut. Unfortunately though, sheer numbers weighed in favour of two other clubs, so we managed third. But, the spin was another event that was well organised, well attended and I managed to get my last century of 2018 in. Do the reverse of the above, and you'll certainly be doing much better than I did!